Before Humphrey Bogart became typecast as, well, Humphrey Bogart, he worked as an actor on Broadway. And he was good. 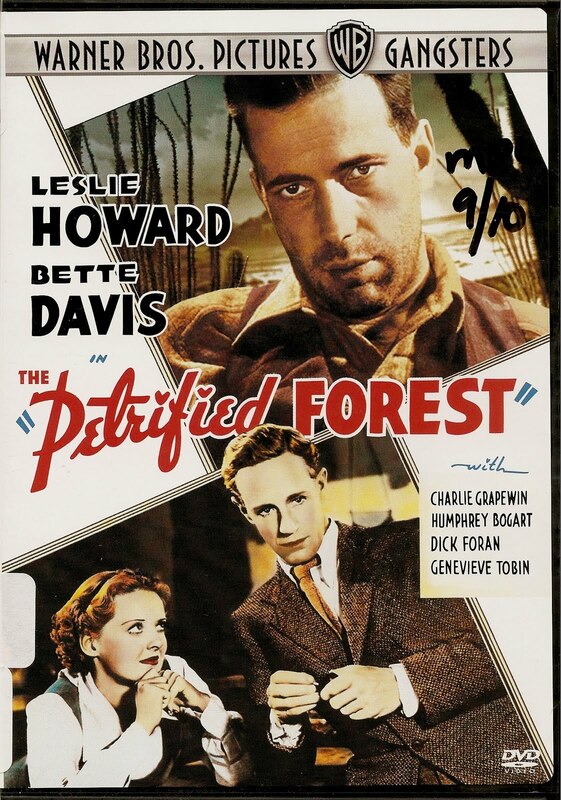 In 1935 he was in a play, "The Petrified Forest", acting opposite Leslie Howard, who would go on to be forever immortalized as Ashley Wilkes in "Gone With the Wind." The play concerned a ruthless gangster named Duke Mantee, played by Bogart. After escaping from prison with 3 other fugitives they head for the Mexican border. When a sandstorm strands them, they wait and hijack the first car that comes along. They then seek shelter in an out of the way cafe owned by an old man, played by Charlie Grapewin, and his son,played by Porter Hall, along with the old man's grandaughter, Gabrielle, played with perfect innocence by Bette Davis. When an idle dreamer wanders into the cafe, Leslie Howard's role, the dynamics of all three parties are changed as each of the characters attempt to assert themselves, and the things in which they believe. When the former occupants of the stolen car arrive, the circle is closed and the tension mounts. This movie might not have been made were it not for the generosity and fellowship of Leslie Howard for his friend, and acting partner, Humphrey Bogart. 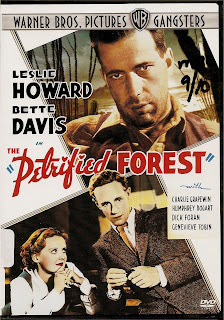 In late 1934 Robert Sherwood was casting for the play of a book called "The Petrified Forest." He had seen Bogart earlier that year in "Invitation to a Murder" and decided that he would be perfect in the role of Duke Mantee. Bogart got the part and the show opened on January 7th, 1935 to rave reviews for Leslie Howard. Bogart was not even named along with the cast in the Herald Tribune. The show was a hit and Warner Brother's studios bought the book, intending to make it into a movie. Leslie Howard had already promised Bogart that if a movie were made from the play, Bogart would have his original part. But this was not his promise to make. When Bogart got word that warner's had bought the book, and that he was only to be "optioned" for the role of Duke Mantee, he sent a cable to Scotland, where Leslie Howard was on vacation. Leslie Howard shot a telegram to Warner's that stated either Bogart was in, or Howard was out. Bogart got a $400 per week contract and the role as Duke Mantee. The rest, is of course, history. The movie itself is a real gem. Over-emoted in places, this is a real old fashioned melodrama, where each character has a deeper meaning. Duke is Evil, but with his own sense of honor. Gabrielle is Innocence, and she falls for Leslie Howard's Dreamer with his ever questioning cyniscm, walking across the country, on his way to the Pacific "to drown, perhaps." The old man represents Memory, and he clearly rejoices in Duke's living outside the law. His son represents the old ways, the way things have always been and should be, with no room for change. The banker, his wife and chauffer are the Establishment, thinking only of money and looking to buy their way out of any situation they are in. The interaction between the black chauffer,Joseph, played by John Alexander and his counterpart in Duke's right hand man, Slim, played by Slim Thompson, is a visual lesson in "lean freedom versus fat slavery." This is one of my all time favorite films. I used to watch it on PBS on Saturday nights when they ran classic films. Classic films have now become the province of AMC and TCM, where there are always classic films playing. And I enjoy them all. But somehow I find myself missing those late Saturday night viewings. They seemed so special when you had to wait.